In the 1960s and 1970s, northern Arizona likely earned a de facto Emmy for its part in the Space Race. Its volcanic terrain and geologic composition put it near the center of the lunar training program for the United States Apollo Missions. Apollo astronauts, including Neil Armstrong and Buzz Aldrin, imagined the northern Arizona landscape as the Moon. 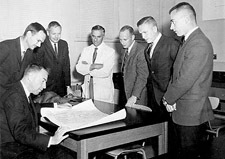 The United States Geological Survey (USGS) established their Astrogeology Science Center in Flagstaff, and the area became a blueprint for the Apollo Missions. Special Collections helps patrons re-imagine the glory days of American space exploration. 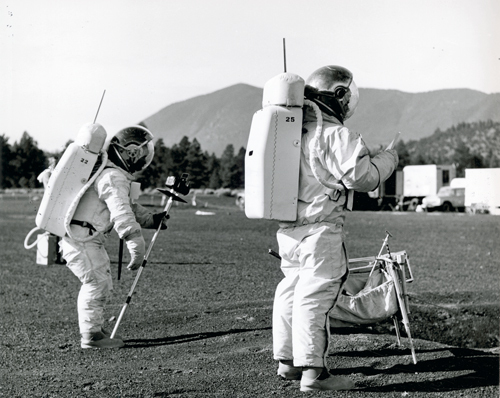 Two USGS geologists in space suits conduct a simulated lunar surface mission at the Cinder Lake crater field east of Flagstaff, Paul Switzer Collection, NAU.PH.426.467, Center of Astrogeology, USGS, Photo No. 116478, Cline Library Special Collections and Archives, Northern Arizona University, Flagstaff, Arizona. 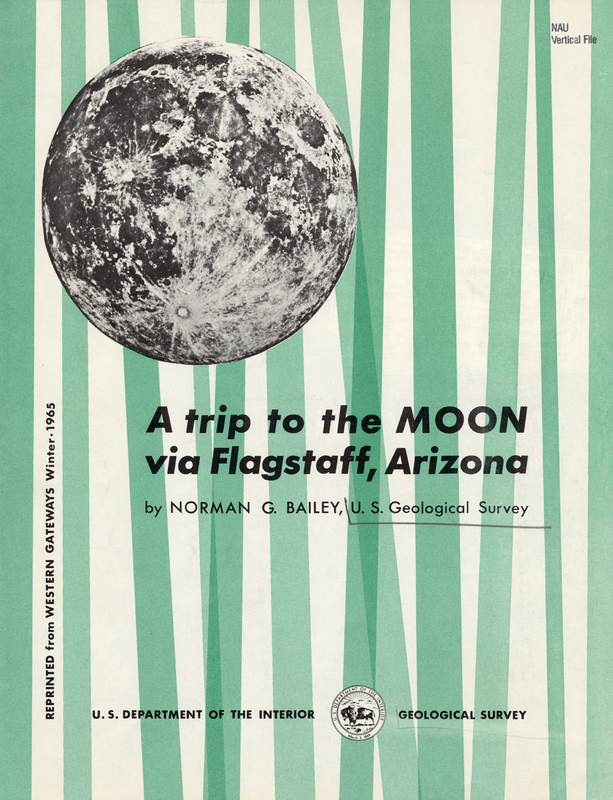 The Astrogeology Research Program started in 1963 when USGS and NASA scientists transformed the northern Arizona landscape into a re-creation of the Moon. They blasted hundreds of different-sized craters in the earth to form the Cinder Lake crater field, creating an ideal training ground for astronauts. 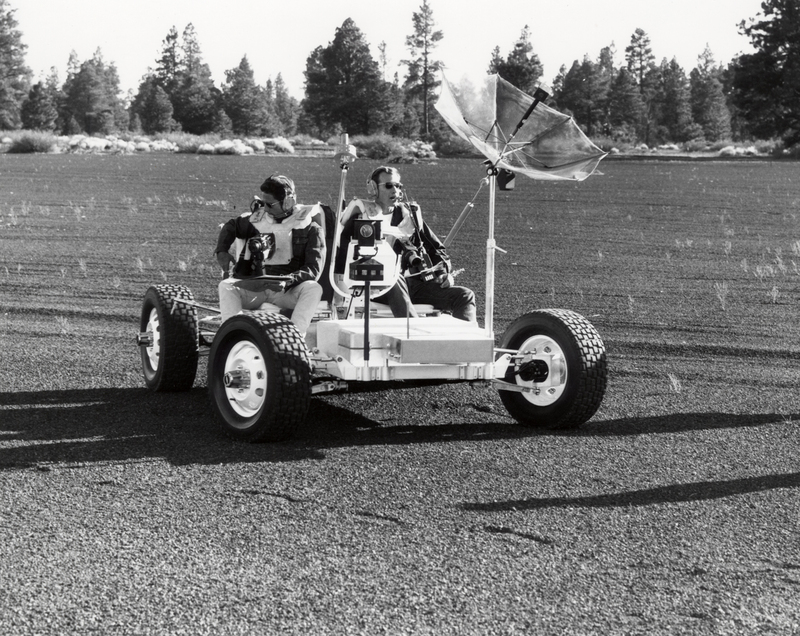 Apollo 15 astronauts Jim Irwin and Dave Scott using "Grover" (a model of the lunar vehicle used on the moon) in a training exercise at the Cinder Lake crater field east of Flagstaff, Paul Switzer Collection, NAU.PH.426.466, Cline Library Special Collections and Archives, Northern Arizona University, Flagstaff, Arizona. 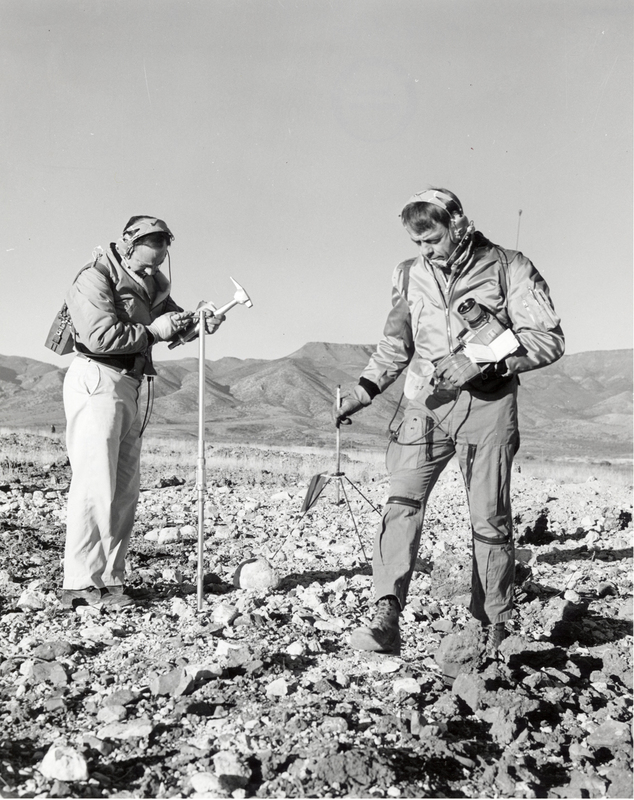 Astronauts Alan Shepard and Edgar Mitchell preparing for the Apollo 14 mission to the moon at a man-made crater field near Cottonwood, Arizona, Paul Switzer Collection, NAU.PH.426.473, Center for Astrogeology, USGS, Photo No. 1170168PR, Cline Library Special Collections and Archives, Northern Arizona University, Flagstaff, Arizona. Using the cinder cones and craters scattered around northern Arizona as models, USGS and NASA scientists, including Eugene Shoemaker, taught astronauts about geologic features and lunar formations. 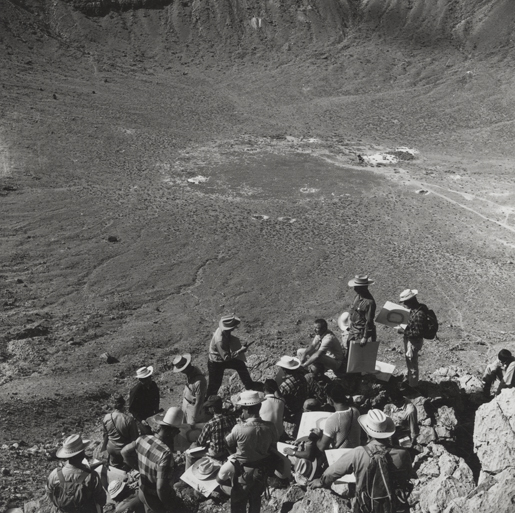 Seen through photographs in the Paul Switzer Collection, they gave lectures and led field exercises at the Cinder Lake crater field, as well as the Grand Canyon, Sunset Crater, Meteor Crater, and Lowell Observatory. 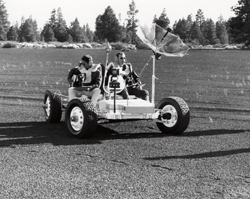 Astronauts ran lunar rover simulations and practiced soil sampling techniques wearing replica space suits in the shadows of the San Francisco Peaks. The training gave them the skills essential for the first succesful manned missions to the Moon. 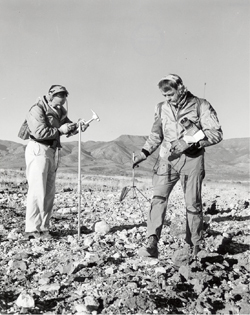 Astronauts Edgar Mitchell (left) and Alan Shepard on a geological field exercise near Cottonwood, Arizona, Paul Switzer Collection, NAU.PH.426.475, Center of Astrogeology, USGS, Photo No. 1170142PR, Cline Library Special Collections and Archives, Northern Arizona University, Flagstaff, Arizona. 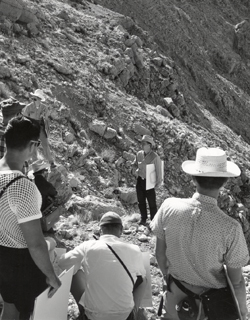 Dr. Eugene Shoemaker at Meteor Crater describing impact structures to astronauts during a training exercise, Paul Switzer Collection, NAU.PH.426.477, Cline Library Special Collections and Archives, Northern Arizona University, Flagstaff, Arizona. Some scholars also credit the Apollo Missions and the Astrogeology Science Center with advancing human understanding of lunar and terrestrial craters and their origins. Scientists traced the formation of lunar and terrestrial craters, including Metero Crater, to large impacts with objects hurling through space. 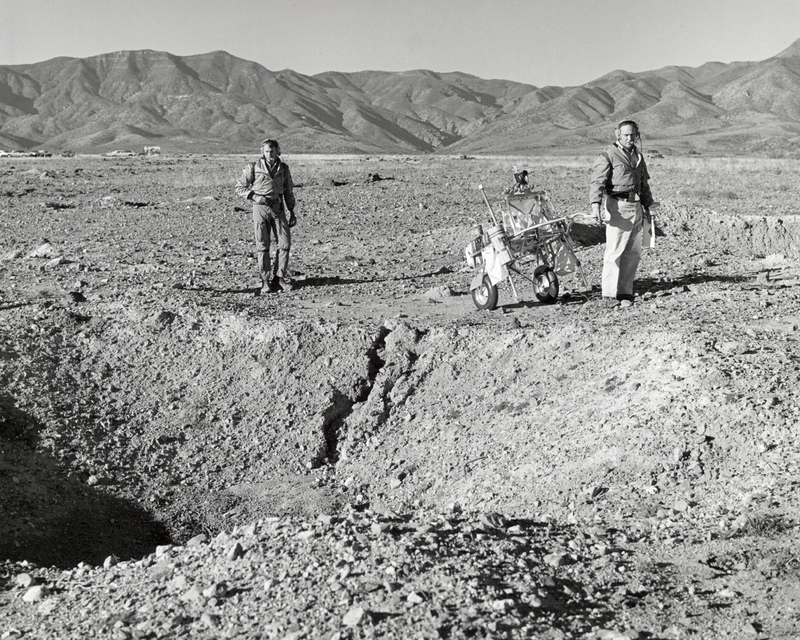 Further research led to the discovery of previously unidentified ancient craters at Sierra Madera in Texas, underlying Chesapeake Bay, and buried in southeastern Nevada. Today, the Astrogeology Science Center still operates, but largely without the fame. Locals associate Cinder Lake with a landfill and not the Moon. Unless it is Halloween, tourists will likely not see astronauts training off of Highway 89 or rambling over cinders in a model of the Apollo lunar rover. Yet "Grover" sits in Flagstaff at the Science Center, tourists can get some of the Apollo Mission experience at Meteor Crater, and the public can re-live the Apollo training program through photographs and other materials, largely held in Vertical Files and the Paul Switzer Collection. Donald A. Beattie, Taking Science to the Moon: Lunar Experiments and the Apollo Program (Baltimore: Johns Hopkins University Press, 2001), 58-77; "USGS Astrogeology: Astronaut Training," http://astrogeology.usgs.gov/About/AstroHistory/astronauts.html (accessed June 4, 2010). Beattie, Taking Science to the Moon256-8. 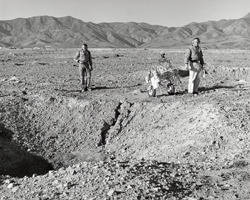 The northern Arizona landscape reached a national audience when CBS News recorded footage and interviews on location at Meteor Crater and other training areas in the region. 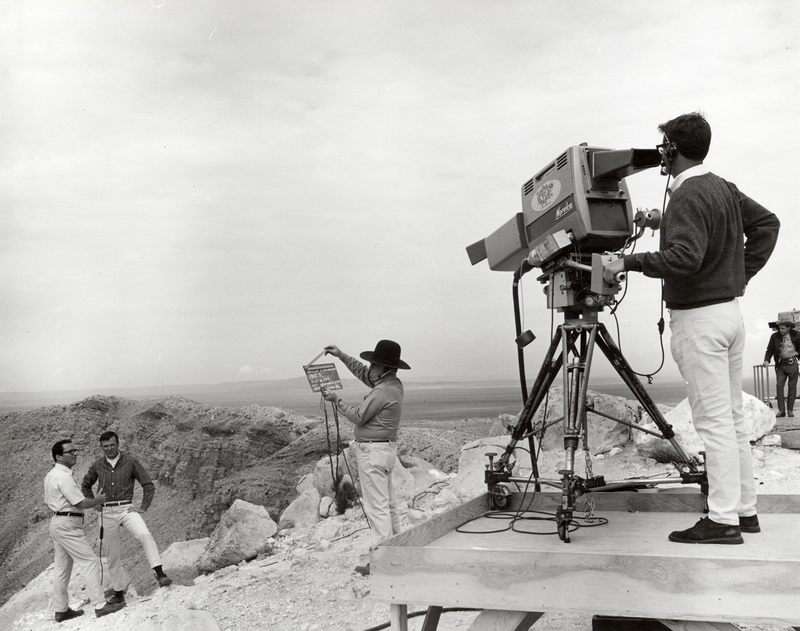 CBS News correspondent George Herman (left) interviewing Dr. David Roddy on the rim of Meteor Crater. CBS videotaped the interview for later use during the TV coverage of the Apollo 11 landing on the moon, Paul Switzer Collection, NAU.PH.426.474, Center for Astrogeology, USGS, Photo No. 769221PR, Cline Library Special Collections and Archives, Northern Arizona University, Flagstaff, Arizona. 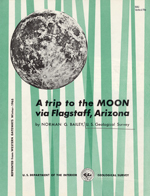 Norman G. Bailey, A trip to the MOON via Flagstaff, Arizona, Vertical Files, USGS, Flagstaff, AZ, Cline Library Special Collections and Archives, Northern Arizona University, Flagstaff, Arizona. The Great Meteor Crater of Arizona pamphlet, Vertical Files, Meteor Crater #1, Cline Library Special Collections and Archives, Northern Arizona University, Flagstaff, Arizona. Meteor Crater: Arizona's Famous Natural Laboratory pamphlet, Vertical Files, Meteor Crater #1, Cline Library Special Collections and Archives, Northern Arizona University, Flagstaff, Arizona.